Just got my 2009 KTM thrown on the Dyno for Tuning Purposes mainly. Currently st 1650 Feet. Stock needle, 170 MJ and 3rd clip down seemed to be just about right. Tad rich at very top, but going to Glamis/Sea Level over weekend which should lean out a bit and hopefully make that about perfect. I know dynos are for tuning purposes mainly, but to have only more or less stock 450 HP and TQ Numbers is rather bothersome. 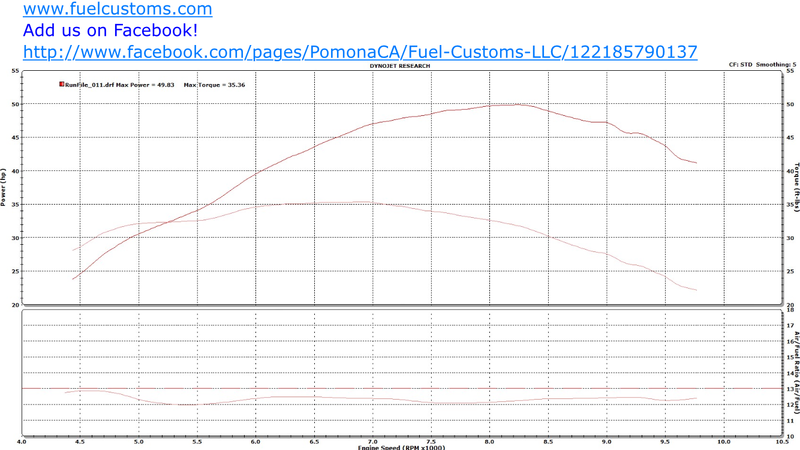 They pulled a Stock YFZR on this dyno last week and it was doing 40-41HP. Not sure about the TQ. My Bike has around 20 hours, KTM Bill Full Exhaust, FCI and Wire Mod as wel as tinned about perfectly. Can anyone chime in regarding these HP and TQ numbers? Best pull my about 43 HP and 33 TQ. Will attach picture of dyno sheet. Following from your other thread. I am curious how far off it was and does it start, run and idle better now. I don't have much experience with the actual numbers other than what I have read on here which is everything I could find when I tuned mine but I know most would tell you it would have been good to have a base so you knew your gains more so than peak power and that all dynos will run a bit different. I know there were some old posts that people would comment on how one guy would have a little better power in the curve and the response would be that it was in the needle. I have read that with the hrc needle there was more power to be had in the mid range. I believe that most of the guys that made good numbers 47-49 hp had smoothies on the dyno and you said you were a bit rich, how rich? Some of drivers old posts stated that 12.5:1 vs 13.5:1 could be as much as 1.5 hp but not really affect your peak tq. I say take your glamis trip and see how it does in the real world and if you want to improve later do the rancho mods yourself or send it out to thumper racing and get the carb bored at the same time. Last edited by Nat05gto; 11-15-2018 at 10:30 PM. Here is mine. I have Akro header / FMF Can, 8/06 Cam, FCI. Jetted wth JD needle (I think Red Needle, Can’t remember clip position). Dyno was at Sea Level and it was a tad rich with a 165 MJ. I have since been running a 162. Needle taper will also affect different size MJ’s. I ride Glamis also. Dyno’s vary, since there is a power loss at altitude i wonder how much that would affect the numbers on your Dyno. Either way, run it see how the seat of the pants HP feels. Last edited by steveo525; 11-16-2018 at 02:32 AM. running a 168 MJ with a needle a lot like the HRC (fat compared to stock), forget the name it’s what bill suggested. I want to say needle on third clip. Roughly 1000-1400 feet is what I usually ride at. I would think your stock internal 450 with just the pipe would be making well over 43. Like said elevation may make for losses, not sure how much. But the Yfzr I believe is rated around 37-38 so that dyno sounds gernous to me. Like everyone says, HP is just a number, ride her and go from there if you aren’t happy. They ended up not adjusting anything actually. 170 MJ. 3rd clip, stock needle still. It happened to be more or less spot on. Bad gas seemed to be the main culprit for the previous issues more than anything. It was just slightly rich towards redline, but not much I guess and mainly due to elevation. Once at sea-level it should lean out slightly. Would the elevation and a needle really effect the power that much though? They advised me to not change anything after the runs. Especially since I was going to glamis Saturday. I would think a minimum of 47-50 HP and 35-36 TQ would be the bottom line a 525 would pull with the the mods I have. Not 43 HP and 33 TQ. That was with slicks on as well. I’ve never seen numbers remotely that low from any dynos with these bikes, even the stock 450XC, yet alone the 525. KTMBill dynod his 525 at 54HP with just his full exhaust and jetting. My numbers are more or less around stock Jap 450 numbers. Definitely seems strange to me to say the least. Either way, it is what it is. I’ll take her out this weekend and see how she runs up the hills against other bikes. My old mostly stock 525 used to smash most very modded 450’s and 700 raptors by quite a few bike lengths. So if this bike ain’t doing at least that with the added FCI and full exhaust now then I’ll have to get things diagnosed I suppose. There’s a blast from the past! Welcome Back Craig! Not the same around here w/o you. A new problem emerged when I hit the dunes today. About 90% of the time I went up a dune the bike completely loses power. Especially throttled in 3rd and 4th gear. When on a flat straight away it mostly didn’t do it though which is interesting. It’s almost a sort of crackled bog like the engine isn’t getting enough fuel or something. It’s not for a lack of actual power or being in too high of a gear kind of bog, cause the power will randomly come back on. It’s on and off. Not sure if it’s a jetting/needle issue, float bowl or perhaps just needing more carb or all of the above. Any ideas on what is going on? and if so, does anyone know someone in SoCal who can really modify and dial these KTM’s in? Obviously I’m not having any luck at all with these dealerships or mom and pop off-road shops. Bummer. Check your intake boot for tearing. I had mine tuned at Fuel Customs in Pomona. Garrett knows the KTM’s pretty well. I checked the Intake and couldn’t find any noticable leaks. I live and work in Huntington Beach, CA. and store my quad 1:15 east in the inland empire. Finding time work on it is always a problem. Garret at fuel customs is an idea, but I really think this thing needs Carb Boring, R&D Float Bowl, HRC needle, etc to get dialed in. If I had that already I’d just take it to Garrett to dial it in perfectly. Money is not an issue, I just need someone who really know these ktm’s inside and out to really get this thing running like a raged silverback gorilla like it should be. Sick of running in circles dropping $$ on this thing and getting know where with it. I’d just take the bike to thumper racing who used to be only 1.5 hours from me to add all the carb goodies/bore, tune perfectly and perhaps add their stage 4 cam and 12:5:1 piston, but they moved 7 hours away to Nevada last year. If anyone has any ideas or knows of another reputable company/shop in Southern California similar to Thumper Racing, feel free to chime in? Did you physically remove the intake manifold boot and inspect? Most likely, you will not see the tearing from a visual inspection while it is still attached to the carb and cylinder head. The symptoms you are stating, bogging, power loss, in 3rd and 4th Gear going up a dune at Glamis and not so much in the flats indicates to me that you may have a tear in the boot and under a load and hammering it up steep and soft dunes would cause the boot to collapse on itself. Further, a 170 MJ and stock needle 3rd clip are not going to cause the issues you are stating with full power loss under a load. 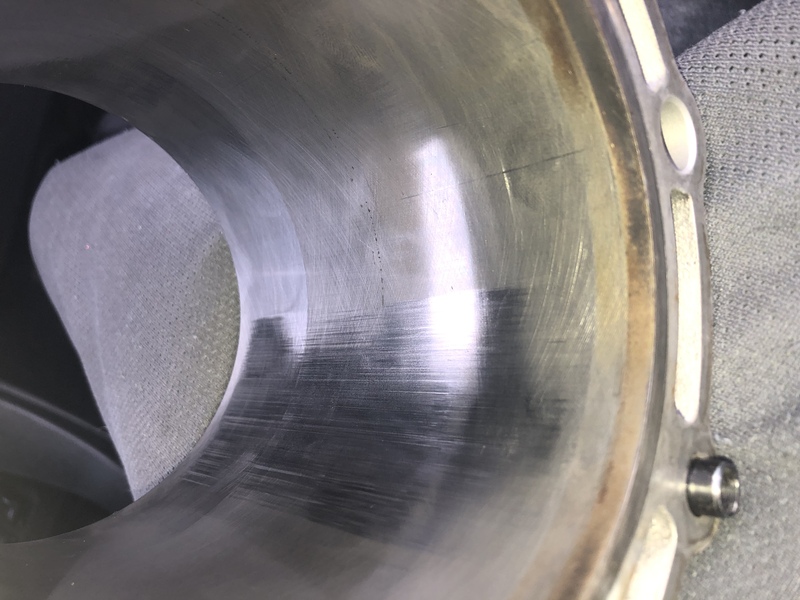 Also, you stated that you already took it to get tuned so maybe the tech overtightened the clamps or the boot got worse from possibly being shifted or twisted or taken off if the tech attempted to change the jetting in the carb. Just my thoughts since I have already been there and done that. My friends 525 has carb boring and all the other stuff done to his carb from sredrum. I have the R&D float bowl and the o’ring mod with the JD needle in the stock bore carb. There is almost no noticeable difference in throttle response and neither have the stock FCR bogging. With the 8/06 Cam in mine, I have more mid and top end then him with the bored and jetted carb and a full KTM Bill Pipe. He has a stock intake setup. Sounds like you just want to drop the bike off at a reputable shop/builder and just have them figure it out and fix it. My recommendation is to call Garrett. He tunes bikes for some of the best builders on the West Coast. I’m sure he can point you in the right direction if one of his onsite mechanics is not able to do what you want. But he can get you whatever it is you need. Other than that, I would recommend loading the bike up and taking it to Thumper, CT Racing, Alba Racing or John at Racers Edge in Tucson AZ. As far as I’m concerned, John is the best in the business and is a one stop shop that can do everything in-house at Racers Edge. I have a feeling though that none of those suggestions are what you want to hear. So I hope someone else chimes in with a spot. Problem is, there are not too many shops/builders left that like to mess with carbs. It’s an EFI industry now. Good luck. Last edited by steveo525; 11-21-2018 at 02:53 PM. Garret at Fuel Customs does grate work he has done both my 525s and I have been very happy with his work. I have also had work done by CT and also does excellent work. You can go wrong with either shop. You might try Allen Knowles at CT Racing. He's in your area and has a dyno. This tells me it's something more than a tuning/jetting issue. I'd guess float level is low is low or possibly the boot if you didn't 100% pull it off and inspect from the inside out. I'd loose complete power on my old LT-Z400 mod motor in the dunes going uphill on a sustained WOT pull because it was running out of fuel eventually from a low float level. Thanks for all the info fellas. Took the bike into CT Racing Two Weeks ago. The bike hadn't been running right ever since I purchased it. Valves ended up being shot due to dirt I'm assuming from previous owner seeing how I've only used it once. Caused them to seize on and off I guess. Makes sense by what the bike had been doing a few months back in Glamis with the power completely cutting in and out. Allen at CT has been extremely helpful. It was already costing me $1100 to fix the current problem with OEM parts, plus install the R&D Float Bowl, Emulsion Tube, so I just went ahead and did CT GNCC Ktm Race Package which after dialing in and tuning will only be $900 more than stock fix price. Kit includes, Carb rebuilding & boring to 41mm, Dyno Tuning, CNC porting of cylinder head, CNC Radius 5 angle valve job for +1mm over size valves, Set of new +1mm Valves, Performance Lightweight Valve Spring Kit with Titanium Retainers, Webcam MX Stage 3 Performance Camshaft, Diamond Honing cylinder and fitting a JE 13:1 Hi Compression racing piston, Complete Top End Gasket kit, Jet Set, Disassembly clean and prep head and assemble head. Allan was getting 51HP on his 525 with CT Full Pipe, Airbox Open and Tuning. Which is inline with most dyno's I've seen. 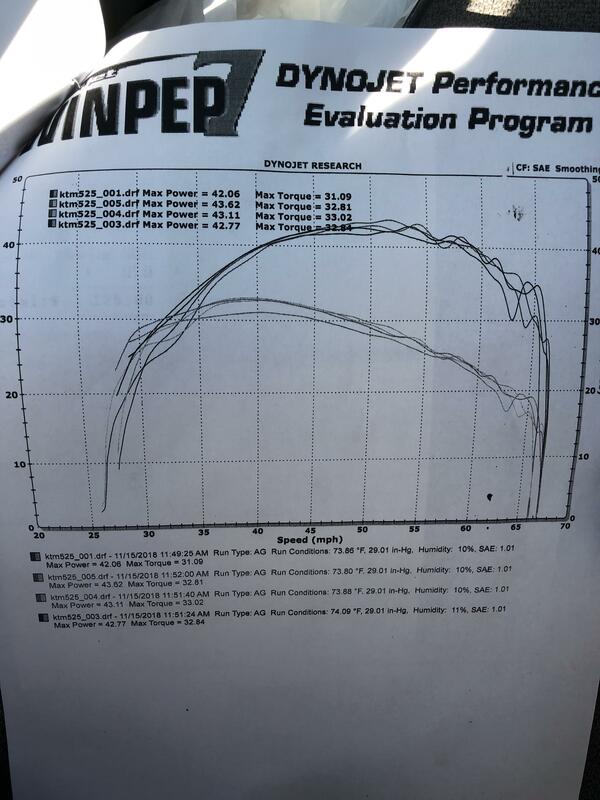 Mine was pulling only 43HP - 33TQ when I first got it dyno at another shop, which is very low for a tuned, full piped, FCI modded 525, but the guys I took it to were clueless, so not sure how accurate it was. Plus the valves were already shot which could've made a large impact on those numbers as well. Be cool to see mid 50's+ HP, 37tq-40tq after CT Build. I'll honestly just be stoked for the bike to run properly. My old stock 525 with jetting ran quite a bit harder than current piped, FCI, 525. Hoping this thing finally runs properly and like a raged ape. Will be testing in Glamis over presidents day. I think you’ll be pleased with that power, and you can always go for more if you want it. You said there was damage from dirty air intake? Let me guess, the guy you bought it from got it muddy/wet/really dirty. If he didn’t then I bet he didn’t clean/oil it well/enough or there’s a rip in the carb boot. But here’s my warning about the FCI, the filter itself I believe is fine, so dry conditions i haven’t had an issue with, but in very wet/muddy conditions the FCI does not keep debris coming from under the seat and on to the filter out. The mud/dirt then sits there and bounces on the bottom of the filter... for dunes I don’t think you’ll have any issues. But, for me, it was costly. Who knows! I took the dude for his word that it was his daughters and she rode it only a handful of times in the Dunes. Approximately 20 hours on it was what I was told when bought it. Got the bike for $5200 and after all is said and done I've put about $3500 more into it to get it running properly, so this thing best be good to go now for Christ sake! I'll only every ride it in dunes or dry dirt/desert. So the FCI filter hopefully will hold up. I bought a second fci filter and outerwear so i can change out after each day of riding as well just to be safe. Yep you should be fine, don’t be conservative when spraying the oil on it, get it soaked on there real good. Just got 525 back from CT Racing today. Will be testing her out all weekend in Glamis. Excited to see how she does in the dunes.